The APX7000 multi-band radio places instant interoperability into the hands of mission-critical first responders. 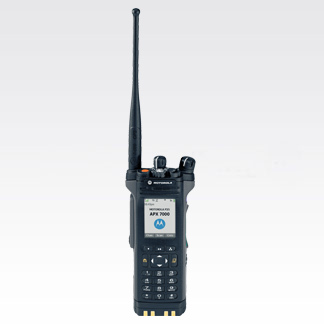 Motorola's 4th generation P25 Subscriber is capable of multi-band interoperability in one radio and can operate in any 2 of the following frequency bands: 700/800 MHz ,VHF, UHF Range 1, and UHF Range 2 offers backward and forward compatibility (FDMA and TDMA), and integrated GPS for outdoor location tracking. Designed with mission-critical technology, the radio amplifies public safety official's ability to keep the community safer than ever before. Weight (with standard battery): 18.4 oz.